Fausto Falconi sincerely believed his many years as an agronomist (soil and plant scientist) would have prepared him well for the challenges of starting his own organic farming and rose production business in Cayambe, Ecuador just North of the capital city of Quito. He was so wrong. “I had to essentially throw the book away on growing roses,” Fausto revealed.”I really had to start from scratch when it came to growing organically.” Fresh Cut emerged from that beginning as one of the best organic rose growers in the world, a difficult task in the extreme, yet here they are doing what many have said could not be done: growing roses 98% free of normal chemical controls. Their goal is to be using 100% natural controls in the very near future. The Ecuadorian flower grower community has long recognized the importance of only using approved chemical controls in their growing operations, minimizing their use, and taking great care to protect their workers from exposure to these chemicals. Why then go to so much trouble to grow roses without chemicals, when no one will be eating them? 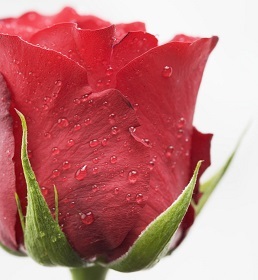 …a leader in Organic Rose Production. That decision to grow the best organic roses resulted in Fresh Cut literally having to start from the ground up, because they realized the first step toward their goal was with the growing medium, the material in which their roses would be grown. In other words, they believed in order to grow the finest roses, they had to start with the finest possible soil – soil in balance, as it occurs naturally in nearby forests. It took years of trial and error to find which combinations of growing materials worked best. And that work is on-going. “Take this soil in your hand,” Fausto suggested. “Can you feel the life it contains?” I scooped up a handful of the nearly black growing medium and, having spent serious time in the garden, could understand why his roses loved this stuff. Between the rows of rose plants, vegetation is literally composting before my eyes, much like would take place in a natural setting. And, these roses! Beautiful, intense colors and straight stems with healthy foliage which will be cut, bunched and then bathed in natural solutions to prevent molds and other things from damaging the flowers. And it all starts with living soil. Another fascinating behind-the-scenes glimpse into the flowers at their source! Thanks for sharing it with us, Terry! Much appreciated!